I was just thinking wouldn't it be nice to make homemade bookplates and give them as Christmas gifts? Perfect stocking stuffers, don't you think? 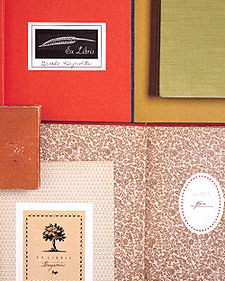 So I did a little looking and found these wonderful BOOKPLATE TEMPLATES (click here) compliments of Martha Stewart Living. Sometimes it's nice to think of such things (and actually follow through on your good idea) while you still have the time to enjoy the process. I especially like the one with the tree image. A set of these would look charming tied with a ribbon and peaking out of some one's stocking, don't you think?